For the autonomous state formed in the region at 1914, see Autonomous Republic of Northern Epirus. The region of Epirus, stretching across Greece and Albania. Border of the territory of the former "Autonomous Republic of Northern Epirus"
Northern Epirus (Greek: Βόρειος Ήπειρος, Vorios Ipiros, Albanian: Epiri i Veriut) is a term used to refer to those parts of the historical region of Epirus, in the western Balkans, which today are part of Albania. The term is used mostly by Greeks and is associated with the existence of a substantial ethnic Greek population in the region. It also has connotations with political claims on the territory on the grounds that it was held by Greece and in 1914 was declared an independent state by the local Greeks against annexation to the newly founded Albanian principality. The term is typically rejected by most Albanians for its irredentist associations. The term "Northern Epirus" was first used in official Greek correspondence in 1886, to describe the northern parts of the Janina Vilayet. It started to be used by Greeks in 1913, upon the creation of the Albanian state following the Balkan Wars, and the incorporation into the latter of territory that was regarded by many Greeks as geographically, historically, culturally, and ethnologically connected to the Greek region of Epirus since antiquity. In the spring of 1914, the Autonomous Republic of Northern Epirus was proclaimed by ethnic Greeks in the territory and recognized by the Albanian government, though it proved short-lived as Albania collapsed with the onset of World War I. Greece held the area between 1914 and 1916 and unsuccessfully tried to annex it in March 1916. In 1917 Greek forces were driven from the area by Italy, who took over most of Albania. The Paris Peace Conference of 1919 awarded the area to Greece, however the area reverted to Albanian control in November 1921, following Greece's defeat in the Greco-Turkish War. During the interwar period, tensions remained high due to the educational issues surrounding the Greek minority in Albania. Following Italy's invasion of Greece from the territory of Albania in 1940 and the successful Greek counterattack, the Greek army briefly held Northern Epirus for a six-month period until the German invasion of Greece in 1941. Tensions remained high during the Cold War, as the Greek minority was subjected to repressive measures (along with the rest of the country's population). Although a Greek minority was recognized by the Hoxha regime, this recognition only applied to an "official minority zone" consisting of 99 villages, leaving out important areas of Greek settlement, such as Himara. People outside the official minority zone received no education in the Greek language, which was prohibited in public. The Hoxha regime also diluted the ethnic demographics of the region by relocating Greeks living there and settling in their stead Albanians from other parts of the country. Relations began to improve in the 1980s with Greece's abandonment of any territorial claims over Northern Epirus and the lifting of the official state of war between the two countries. In the post Cold War era relations have continued to improve though tensions remain over the availability of education in the Greek language outside the official minority zone, property rights, and occasional violent incidents targeting members of the Greek minority. Ancient Greek settlements in Albania. Classical Epirus shown in grey. Borders of ancient Epirus (blue), of ancient Macedonia (green). Blue dotted line: borders of the Greek world c. 6th century AD. The term Epirus is used both in the Albanian and Greek language, but in Albanian refers only to the historical and not the modern region. Rather than a clearly defined geographical term, "Northern Epirus" is largely a political and diplomatic term applied to those areas partly populated by ethnic Greeks that were incorporated into the newly independent Albanian state in 1913. According to the 20th century definition, Northern Epirus stretches from the Ceraunian Mountains north of Himara southward to the Greek border, and from the Ionian coast to Lake Prespa. The region defined as Northern Epirus thus stretches further east than classical Epirus, and includes parts of the historical region Macedonia. Northern Epirus is rugged, characterized by steep limestone ridges that parallel the Ionian coast, with deep valleys between them. The main rivers of the area are: Vjosë/Aoos (Greek: Αώος, Aoos) its tributary the Drino (Greek: Δρίνος, Drinos), the Osum (Greek: Άψος Apsos) and the Devoll (Greek: Εορδαϊκός Eordaikos). Some of the cities and towns of the region are: Himarë, Sarandë, Delvinë, Gjirokastër, Tepelenë, Përmet, Leskovik, Ersekë, Korçë, Bilisht and the once prosperous town of Moscopole. Many of the region’s settlements are associated with the Trojan Epic Cycle. Elpenor from Ithaca, in charge of Locrians and Abantes from Evia, founded the cities of Orikum and Thronium on the Bay of Aulon. Amantia was believed to have been founded by Abantes from Thronium. Neoptolemos of the Aeacid dynasty, in charge of Myrmidones, founded a settlement which in classical antiquity would become known as Bylliace (near Apollonia). 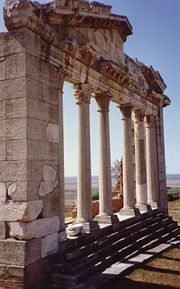 Aeneas and Helenus were believed to have founded Bouthroton (modern-day Butrint). Moreover, a son of Helenus named Chaon was believed to be the ancestral leader of the Chaonians. Epirus has been occupied since at least Neolithic times by seafarers along the coast and by hunters and shepherds in the interior who brought with them the Greek language. These people buried their leaders in large tumuli containing shaft graves, similar to the Mycenaean tombs, indicating an ancestral link between Epirus and the Mycenaean civilization. The earliest recorded inhabitants of the region (c. 7th century BC) were the Chaonians, one of the main Greek tribes of ancient Epirus, and the region was known as Chaonia. During the 7th century BC, Chaonian rule was dominant over the region and their power stretched from the Ionian coast to the region of Korçë in the east. Important Chaonian settlements in the area included their capital Phoenice, the ports of Onchesmos and Chimaera (modern-day Saranda and Himara, respectively), and the port of Bouthroton (modern-day Butrint. Tumulus II in Kuc i Zi near modern Korçë is to date to that age (c. 650 BC) and it is claimed that it belonged to Chaonian nobles. The strength of the Chaonians prevented other Greeks from establishing colonies on the Chaonian shore, however, several colonies were established in the 8th-6th centuries BC immediately to the north of the Ceraunian Mountains, the northern limit of Chaonian territory. These include Aulon (modern-day Vlorë), Apollonia, Epidamnus (modern-day Durrës, Oricum, Thronium, and Amantia. When the Roman Empire split into East and West, Epirus became part of the East Roman (Byzantine) Empire; the region witnessed the invasions of several nations: Visigoths, Avars, Slavs, Serbs, Normans, and various Italian city-states and dynasties (14th century). However, the region’s culture remained closely tied to the centers of the Greek world, and retained its Greek character through the medieval period. In 1204, the region was part of the Despotate of Epirus, a successor state of the Byzantine Empire. Despot Michael I found there strong Greek support in order to facilitate his claims for the Empire’s revival. In 1210 the earliest mention of Albanians in the region is recorded, nevertheless, significant Albanian movements are not mentioned prior to 1337. In 1281, a strong Sicilian force that planned to conquer Constantinople was repelled in Berat after a series of combined operations by local Epirotes and Byzantine troops. In 1345, the region was ruled by the Serbs of Stefan Dušan. However, the Serbian rulers retained much of the Byzantine tradition and used Byzantine titles to secure the loyalty of the local population. At the same time Venetians controlled various ports of strategic importance, like Vouthroton, but the Ottoman presence became more and more intense until finally in the middle of the 15th century, the entire area came under Turkish rule. Following the Ottoman conquest, local authorities were exclusively Muslim, ethnically either Albanian or Turkish. However, there were specific parts of Epirus that enjoyed local autonomy, such as Himarë, Droviani, or Moscopole. In spite of the Ottoman presence, Christianity prevailed in many areas and became an important reason for preserving the Greek language, which was also the language of trade. Between the 16th and 19th centuries, inhabitants of the region participated in the Greek Enlightenment. One of the leading figures of that period, the Orthodox missionary Cosmas of Aetolia, traveled and preached extensively in northern Epirus, founding the Acroceraunian School in Himara in 1770. It is believed that he founded more than 200 Greek schools until his execution by Turkish authorities near Berat. In addition, the first printing press in the Balkans, after that of Constantinople, was founded in Moscopole (nicknamed "New Athens") by a local Greek. From the mid-18th century trade in the region was thriving and a great number of educational facilities and institutions were founded throughout the rural regions and the major urban centers as benefactions by several Epirot entrepreneurs. In Korçë a special community fund was established that aimed at the foundation of Greek cultural institutions. During this period a number of uprisings against the Ottoman Empire periodically broke out. In the Orlov Revolt (1770) several units of Riziotes, Chormovites and Himariotes supported the armed operation. Northern Epirus took also part in the Greek War of Independence (1821–1830): many locals revolted, organized armed groups and joined the revolution. The most distinguished personalities were the engineer Konstantinos Lagoumitzis from Hormovo and Spyromilios from Himarë. The latter was one of the most active generals of the revolutionaries and participated in several major armed conflicts, such as the Third Siege of Missolonghi, where Lagoumitzis was the defenders' chief engineer. Spyromilios also became a prominent political figure after the creation of the modern Greek state and discreetly supported the revolt of his compatriots in Ottoman-occupied Epirus in 1854. Another uprising in 1878, in the Saranda-Delvina region, with the revolutionaries demanding union with Greece, was suppressed by the Ottoman forces, while in 1881, the Treaty of Berlin awarded to Greece the southernmost parts of Epirus. According to the Ottoman "Millet" system, religion was a major marker of ethnicity, and thus all Orthodox Christians (Greeks, Aromanians, Orthodox Albanians, Slavs etc.) were classified as "Greeks", while all Muslims (including Muslim Albanians, Greeks, Slavs etc.) were considered "Turks". The dominant view in Greece considers Orthodox Christianity an integral element of the Hellenic heritage, as part of its Byzantine past. Thus, official Greek government policy from c. 1850 to c. 1950, adopted the view that speech was not a decisive factor for the establishment of a Greek national identity. With the outbreak of the First Balkan War (1912–13) and the Ottoman defeat, the Greek army entered the region. The outcome of the following Peace Treaties of London and of Bucharest, signed at the end of the Second Balkan War, was unpopular among both Greeks and Albanians, as settlements of the two people existed on both sides of the border: the southern part of Epirus was ceded to Greece, while Northern Epirus, already under the control of the Greek army, was awarded to the newly found Albanian State. However, due to the late emergence and fluidity of Albanian national identity and an absence of religious Albanian institutions, loyalty in Northern Epirus especially amongst the Orthodox to potential Albanian rule headed by (Albanian) Muslim leaders was not guaranteed. Part of the map "Epire du Nord, Thrace, Asie Mineure" (c. 1920), adapted to show the legends. Printed in Paris by H. Pidot. In accordance with the wishes of the local Greek population, the Autonomous Republic of Northern Epirus, centered in Gjirokastër on account of the latter's large Greek population, was declared in March 1914 by the pro-Greek party, which was in power in southern Albania at that time. Georgios Christakis-Zografos, a distinguished Greek politician from Lunxhëri, took the initiative and became the head of the Republic. Fighting broke out in Northern Epirus between Greek irregulars and Muslim Albanians who opposed the Northern Epirot movement. In May, autonomy was confirmed with the Protocol of Corfu, signed by Albanian and Northern Epirote representatives and approved by the Great Powers. The signing of the Protocol ensured that the region would have its own administration, recognized the rights of the local Greeks and provided self-government under nominal Albanian sovereignty. Under an October 1914 agreement among the Allies, Greek forces re-entered Northern Epirus and the Italians seized the Vlore region. Greece officially annexed Northern Epirus in March 1916, but was forced to revoke by the Great Powers. During the war the French Army occupied the area around Korçë in 1916, and established the Republic of Korçë. In 1917 Greece lost control of the rest of Northern Epirus to Italy, who by then had taken over most of Albania. The Paris Peace Conference of 1919 awarded the area to Greece after World War I, however, political developments such as the Greek defeat in the Greco-Turkish War (1919–22) and, crucially, Italian, Austrian and German lobbying in favor of Albania resulted in the area being ceded to Albania in November 1921. The Albanian Government, with the country's entrance to the League of Nations (October 1921), made the commitment to respect the social, educational, religious rights of every minority. Questions arose over the size of the Greek minority, with the Albanian government claiming 16,000, and the League of Nations estimating it at 35,000-40,000. In the event, only a limited area in the Districts of Gjirokastër, Sarandë and four villages in Himarë region consisting of 15,000 inhabitants was recognized as a Greek minority zone. After World War II, Albania was governed by a Stalinist regime led by Enver Hoxha, which suppressed the minority (along with the rest of the population) and took measures to disperse it or at least keep it loyal to Albania. Pupils were taught only Albanian history and culture at primary level, the minority zone was reduced from 103 to 99 villages (excluding Himarë), many Greeks were forcibly removed from the minority zones to other parts of the country, thereby losing their fundamental minority rights (as a product of communist population policy, an important and constant element of which was to pre-empt ethnic sources of political dissent). Greek place-names were changed to Albanian ones, and Greeks were forced to change their personal names into Albanian names. Archeological sites of the Ancient Greek and Roman era were also presented as "Illyrian" by the state. The use of the Greek language, prohibited everywhere outside the minority zones, was prohibited for many official purposes within them as well. As a result of these policies, relations with Greece remained extremely tense throughout most of the Cold War. On the other hand, Enver Hoxha favored a few specific members of the minority, offering them prominent positions within the country's system, as part of his "tokenism" policy. However, when the Soviet General Secretary Nikita Khrushchev asked about giving more rights to the minority, even autonomy, the answer was negative. Strict censorship was introduced in communist Albania as early as 1944, while the press remained under tight dictatorial control right up until the end of the Eastern Bloc (1991). In 1945, Laiko Vima, a propaganda organ of the Party of Labour of Albania, was the only printed media that was allowed to be published in Greek and was accessible only within Gjirokastër District. Although the Greek minority had some limited rights, during that period a number of Muslim Cham Albanians, that were expelled from Greece after World War II, were given new homes in the area, diluting the local Greek element. Albanian resettlement policy included Muslim Albanian villagers who as state employees were resettled in newly created villages that served as a buffer zone between the recognized Greek 'minority zone' and traditionally Orthodox Albanian speaking regions of internally polarized national identity, as well as the permanent settlement of Albanian populations inside the minority zone and in other traditionally Greek speaking regions, such as in Himara. Stalinist Albania, already increasingly paranoid and isolated after de-Stalinization and the death of Mao Zedong (1976), restricted visitors to 6,000 per year, and segregated those few that traveled to Albania. The country was virtually isolated and common penalties for attempts to escape the country, for ethnic Greeks, were execution for the offenders and exile for their families, usually in mining camps in central and northern Albania. The regime maintained twenty-nine prisons and labour camps throughout Albania, that were filled with more than 30,000 "enemies of the state" year after year. It was unofficially reported that a large percentage of the imprisoned were ethnic Greeks. During this time, some Greeks and Orthodox Albanians with a Greek national consciousness managed to flee Albania and resettle in Greece. The state attempted to suppress any religious practice (both public and private), adherence to which was considered "anti-modern" and dangerous to the unity of the Albanian state. The process started in 1949, with the confiscation and nationalization of Orthodox Church property and intensified in 1967 when the authorities conducted a violent campaign to extinguish all religious life in Albania, claiming that it had divided the Albanian nation and kept it mired in backwardness. Student agitators combed the countryside, likewise forcing Albanians and Greeks to quit practicing their faith. All churches, mosques, monasteries and other religious institutions were closed or converted into warehouses, gymnasiums, and workshops. Clergy were imprisoned, and owning an icon became an offense that could be prosecuted under Albanian law. The campaign culminated in an announcement that Albania had become the world's first atheistic state, a feat touted as one of Enver Hoxha's greatest achievements. Christians were prohibited from mentioning Orthodoxy even in their own homes, visiting their parents’ graves, light memorial candles or make the sign of the Cross. In this respect, the campaign against religions hit ethnic Greeks disproportionately, since affiliation to the Eastern Orthodox rite has traditionally been a strong component of Greek identity. The first serious attempt to improve relations was initiated by Greece in the 1980s, during the government of Andreas Papandreou. In 1984, during a speech in Epirus, Papandreou declared that the inviolability of European borders as stipulated in the Helsinki Final Act of 1975, to which Greece was a signatory, applied to the Greek-Albanian border. The most significant change occurred on 28 August 1987, when the Greek Cabinet lifted the state of war that had been declared since November 1940. At the same time, Papandreou deplored the "miserable condition under which the Greeks in Albania live". Beginning in 1990, large number of Albanian citizens, including members of the Greek minority, began seeking refuge in Greece. This exodus turned into a flood by 1991, creating a new reality in Greek-Albanian relations. With the fall of communism in 1991, Orthodox churches were reopened and religious practices were permitted after 35 years of strict prohibition. Moreover, Greek-language education was initially expanded. In 1991 ethnic Greeks shops in the town of Saranda were attacked, and inter-ethnic relations throughout Albania worsened. Greek-Albanian tensions escalated in November 1993 when seven Greek schools were forcibly closed by the Albanian police. A purge of ethnic Greeks in the professions in Albania continued in 1994, with particular emphasis in law and the military. Tensions increased when on 20 May 1994 the Albanian Government took into custody five members of the ethnic Greek advocacy organization Omonoia on the charge of high treason, accusing them of secessionist activities and illegal possession of weapons (a sixth member was added later). Sentences of six to eight years were handed down. The accusations, the manner in which the trial was conducted and its outcome were strongly criticized by Greece as well as international organizations. Greece responded by freezing all EU aid to Albania, sealing its border with Albania, and between August–November 1994, expelling over 115,000 illegal Albanian immigrants, a figure quoted in the US Department of State Human Rights Report and given to the American authorities by their Greek counterpart. Tensions increased even further when the Albanian government drafted a law requiring the head of the Orthodox Church in Albania be born in Albania, which would force the then head of the church, the Greek Archbishop Anastasios of Albania from his post. In December 1994, however, Greece began to permit limited EU aid to Albania as a gesture of goodwill, while Albania released two of the Omonoia defendants and reduced the sentences of the remaining four. In 1995, the remaining defendants were released on suspended sentences. Although relations between Albania and Greece have greatly improved in recent years, the Greek minority in Albania continues to suffer discrimination particularly regarding education in the Greek language, property rights of the minority, and violent incidents against the minority by nationalist extremists. Tensions resurfaced during local government elections in Himara in 2000, when a number of incidents of hostility towards the Greek minority took place, as well as with the defacing of signposts written in Greek in the country's south by Albanian nationalist elements, and more recently following the death of Aristotelis Goumas. There has been a growing campaign by the Albanian government to demolish ethnic Greek homes. According to diplomatic sources, there has recently been an upsurge in nationalist activity among Albanians targeting the Greek minority, especially following the ruling of the International Court of Justice in favor of Kosovo's independence. Regions with a traditional presence of ethnic or linguistic groups other than Albanian (Blue for Greeks) and recognized 'minority zones'. In general Albania and Greece hold different and often conflicting estimations, as they have done so for the last 20 years. According to data presented to the 1919 Paris Conference, by the Greek side, the Greek minority numbered 120,000, and the 1989 census under the communist regime cited only 58,785 Greeks although the total population of Albania had tripled in the meantime. Estimations by the Albanian government during the early 1990s raised the number to 80,000. The Unrepresented Nations and Peoples Organization estimates the Greek minority at approximately 70,000 people. Other independent sources estimate that the number of Greeks in Northern Epirus is 117,000 (about 3.5% of the total population), a figure close to the estimate provided by The World Factbook (2006) (about 3%). But this number was 8% by the same agency a year before. A 2003 survey conducted by Greek scholars estimate the size of the Greek minority at around 60.000. The total population of Northern Epirus is estimated to be around 577,000 (2002), with main ethnic groups being Albanians, Greeks and Vlachs. In addition an estimated of 189,000 ethnic Greeks who are Albanian citizens reside in Greece. Ethnographic map of Northern Epirus in 1913, presented by Greece in Paris Peace Conference (1919). The Orthodox Christian communities are recognized as juridical persons, like the others. They will enjoy the possessions of property and be free to dispose of it as they please. The ancient rights and hierarchical organization of the said communities shall not be impaired except under agreement between the Albanian Government and the Ecumenical Patriarchate of Constantinople. Education shall be free. In the schools of the Orthodox communities the instruction shall be in Greek. In the three elementary classes Albanian will be taught concurrently with Greek. Nevertheless, religious education shall be exclusively in Greek. Liberty of language:The permission to use both Albanian and Greek shall be assured, before all authorities, including the Courts, as well as the elective councils. These provisions will not only be applied in that part of the province of Corytza now occupied militarily by Albania, but also in the other southern regions. The Albanian Government continues to use the term "minority zones" to describe the southern districts consisting of 99 towns and villages with generally recognized majorities of ethnic Greeks. In fact it continues to contend that all those belonging to national minorities are recognized as such, irrespective of the geographical areas in which they live. However, the situation is somewhat different in practice. This results in a situation in which the protection of national minorities is subject to overly rigid geographical restrictions, restricting access to minority rights outside these zones. One of the major fields in which it has a practical application is that of education. Reported declared Greeks in the 2011 Albanian Census; Greeks and other groups are thought to have been underrepresented in numbers due to boycott and irregularities. The census of October 2011 included ethnicity for the first time in post-communist Albania, a long-standing demand of the Greek minority and of international organizations. However, Greek representatives already found this procedure unacceptable due to article 20 of the Census law, which was proposed by the nationalist oriented Party for Justice, Integration and Unity and accepted by the Albanian government. According to this, there is a $1,000 fine for someone who will declare anything other than what was written down on his birth certificate, including certificates from the communist-era where minority status was limited to only 99 villages. Indeed, Omonoia unanimously decided to boycott the census, since it violates the fundamental right of self-determination. Moreover, the Greek government called its Albanian counterpart for urgent action, since the right of free self-determination is not being guaranteed under these circumstances. Vasil Bollano, the head of Omonoia declared that: "We, as minority representatives, state that we do not acknowledge this process, nor its product and we are calling our members to refrain from participating in a census that does not serve the solution of current problems, but their worsening". The minority's sociopolitical organization from promotion of Greek human rights, Omonoia, founded in January 1991, took an active role on minority issues. Omonoia was banned in the parliamentary elections of March 1991, because it violated the Albanian law which forbade 'formation of parties on a religious, ethnic and regional basis'. This situation resulted in a number of strong protests not only from the Greek side, but also from international organizations. Finally, on behalf of Omonoia, the Unity for Human Rights Party contested at the following elections, a party which represents that Greek minority in the Albanian parliament. In 2004, there were five ethnic Greek members in the Albanian Parliament, and two ministers in the Albanian cabinet. The return to Albania of ethnic Greeks that were expelled during the past regime seemed possible after 1991. However, the return of their confiscated properties is even now impossible, due to Albanian's inability to compensate the present owners. Moreover, the full return of the Orthodox Church property also seems impossible for the same reasons. Greek education in the region was thriving during the late Ottoman period (18th-19th centuries). When the First World War broke out in 1914, 360 Greek language schools were functioning in Northern Epirus (as well as in Elbasan, Berat, Tirana) with 23,000 students. During the following decades the majority of Greek schools were closed and Greek education was prohibited in most districts. In the post-communist period (after 1991), the reopening of schools was one of the major objectives of the minority. In April 2005 a bilingual Greek-Albanian school in Korçë, and after many years of efforts, a private Greek school was opened in the Himara municipality in spring of 2006. The Albanian government should take the initiative to conduct a census on ethnological basis and give its citizens the right to choose their ethnicity without limitations. In April 1994, Albania announced that unknown individuals attacked a military camp near the Greek-Albanian border (Peshkëpi incident), with two soldiers killed. Responsibility for the attack was taken by MAVI (Northern Epirus Liberation Front), which officially ceased to exist at the end of World War II. This incident triggered a serious crisis in Albanian-Greek relations. ^ Douglas, Dakin (1962). "The Diplomacy of the Great Powers and the Balkan States, 1908–1914". Balkan Studies. 3: 372–374. Retrieved 2010-11-09. ^ Pentzopoulos, Dimitri (2002). The Balkan Exchange of Minorities and its Impact on Greece. C. Hurst & Co. Publishers. p. 28. ISBN 9781850657026. Northern epirus is the southern part of Albania... The Christian Greeks revolted and formed a provisional and autonomous government. ^ Skoulidas, Ilias (2001). "The Relations Between the Greeks and the Albanians during the 19th Century: Political Aspirations and Visions (1875-1897)". didaktorika.gr. University of Ioannina: 230. doi:10.12681/eadd/12856. χρησιμοποιεί τον όρο «Βόρειος Ήπειρος» ώστε να περιγράψει βόρειες περιοχές του βιλαετίου Ιωαννίνων, κυρίως του σαντζακίου Αργυροκάστρου, στις οποίες εκτεινόταν η δικαιοδοσία του. Είναι από τις πρώτες χρήσεις του όρου σε διπλωματικά έγγραφα..
^ a b c d e f g h i j k l m n o p q r s Konidaris, Gerasimos (2005). Schwandner-Sievers, Stephanie (ed.). The new Albanian migrations. Sussex Academic Publishing. p. 66. ISBN 9781903900789. This area called 'Northern Epirus' by many Greeks, is regarded as geographically, historically, ethnologically and culturally connected with the northern Greek territory of Epirus since antiquity... The term 'Northern Epirus' (which Albania rejects as irredentist) started to be used by Greece around 1913. ^ a b Tucker, Spencer; Roberts, Priscilla Mary (2005). World War I: encyclopedia. ABC-CLIO. p. 77. ISBN 978-1-85109-420-2. Retrieved 26 January 2011. ^ a b Miller, William (1966). The Ottoman Empire and Its Successors, 1801-1927. Routledge. pp. 543–544. ISBN 978-0-7146-1974-3. ^ Smith, William (2006). A New Classical Dictionary of Greek and Roman Biography, Mythology and Geography. Whitefish, MT, USA: Kessinger Publishing. p. 423. ^ a b "Epirus". Encyclopædia Britannica. Encyclopædia Britannica, Inc. Retrieved 16 November 2013. ^ P. R. Franke, "Pyrrhus", in The Cambridge Ancient History VII Part 2: The Rise of Rome to 220 BC: 469, ed. Frank William Walbank. Cambridge University Press, 1984. ISBN 0-521-23446-8. ^ Giakoumis, Konstantinos (2003). "Fourteenth-century Albanian migration and the ‘relative autochthony’ of the Albanians in Epeiros. The case of Gjirokastër." Byzantine and Modern Greek Studies. 27. (1): 176. "The presence of Albanians in the Epeirote lands from the beginning of the thirteenth century is also attested by two documentary sources: the first is a Venetian document of 1210, which states that the continent facing the island of Corfu is inhabited by Albanians. "; p.177. ^ Stavro Skendi. The Albanian National Awakening, 1878-1912. Princeton University Press, 1967. ^ Sakellariou, M. V. (1997). Epirus, 4000 years of Greek history and civilization. Ekdotike Athenon. p. 255. ISBN 978-960-213-371-2. ^ Pappas, Nicholas Charles (1991). Greeks in Russian military service in the late eighteenth and early nineteenth centuries. Nicholas Charles Pappas. pp. 318, 324. ISBN 0-521-23447-6. ^ Baltsiotis. The Muslim Chams of Northwestern Greece. 2011. "The fact that the Christian communities within the territory which was claimed by Greece from the mid 19th century until the year 1946, known after 1913 as Northern Epirus, spoke Albanian, Greek and Aromanian (Vlach), was dealt with by the adoption of two different policies by Greek state institutions. The first policy was to take measures to hide the language(s) the population spoke, as we have seen in the case of “Southern Epirus”. The second was to put forth the argument that the language used by the population had no relation to their national affiliation. To this effect the state provided striking examples of Albanian speaking individuals (from southern Greece or the Souliotēs) who were leading figures in the Greek state. As we will discuss below, under the prevalent ideology in Greece at the time every Orthodox Christian was considered Greek, and conversely after 1913, when the territory which from then onwards was called “Northern Epirus” in Greece was ceded to Albania, every Muslim of that area was considered Albanian." ^ Clogg 2002: 79. "In February 1913, Greek troops captured Ioannina, the capital of Epirus. The Turks recognised the gains of the Balkan allies by the Treaty of London of May 1913." ^ Clogg 2002: 81. "The Second Balkan War was of short duration and the Bulgarians were soon forced to the negotiating table. By the Treaty of Bucharest (August 1913) Bulgaria was obliged to accept a highly unfavorable territorial settlement, although she did retain an Aegean outlet at Dedeagatch (now Alexandroupolis in Greece). Greece's sovereignty over Crete was now recognized but her ambition to annex Northern Epirus, with its substantial Greek population, was thwarted by the incorporation of the region into an independent Albania." ^ Winnifrith, 2001, p. 130 "...in Northern Epirus loyalty to an Albania with a variety of Muslim leaders competing in anarchy cannot have been strong. In Macedonia, where Greece managed to hold on to large territorial gains,she faced a Bulgarian minority with its own Church and quite a long-establish nationali identity. The same cannot be said of the Albanians in Northern Epirus." ^ Smith, Michael Llewellyn (2006). "Venizelos' diplomacy, 1910-23: From Balkan alliance to Greek-Turkish Settlement". In Kitromilides, Paschalis. Eleftherios Venizelos: the trials of statesmanship. Edinburgh: Edinburgh University Press. ISBN 9780748624782. p. 150. "When the Greek army withdrew from Northern Epirot territories in accordance with the ruling of the Powers, a fierce struggle broke out between Muslim Albanians and Greek irregulars." ^ Petiffer 2001: "In May 1914, the Great Powers signed the Protocol of Corfu, which recognized the area as Greek, after which it was occupied by the Greek army from October 1914 until October 1915." ^ Stavrianos, Leften Stavros; Stoianovich, Traian (2008). The Balkans since 1453. Hurst & Company. p. 710. ISBN 978-1-85065-551-0. Retrieved 10 February 2011. ^ Griffith W. Albania and the Sino-Soviet Rift. Cambridge, Massachusetts: 1963: 40, 95. ^ Petiffer 2001: "Under King Zog, the Greek villages suffered considerable repression, including the forcible closure of Greek-language schools in 1933–34 and the ordering of Greek Orthodox monasteries to accept mentally sick individuals as inmates." ^ a b Manta, Elevtheria (2005). Aspects of Italian influence upon Greek - Albanian relations during the interwar period. Aristotle University of Thessaloniki. p. 30. "Πιο συγκεκριμένα, στο προστατευτικό νομικό πλαίσιο της μειονότητας συμπεριλήφθηκαν μόνο οι Έλληνες που κατοικούσαν στις περιφέρειες Αργυροκάστρου και Αγίων Σαράντα και σε τρία από τα χωριά της Χιμάρας (Χιμάρα, ∆ρυμάδες και Παλάσσα), ενώ αποκλείστηκαν αυθαίρετα όσοι κατοικούσαν στην περιοχή της Κορυτσάς και στα υπόλοιπα τέσσερα χωριά της Χιμάρας Βούνο, Πήλιουρι, Κηπαρό και Κούδεσι, αλλά και όσοι κατοικούσαν στα μεγάλα αστικά κέντρα της ‘μειονοτικής ζώνης’, δηλαδή στο Αργυρόκαστρο, τους Άγιους Σαράντα και την Πρεμετή, πόλεις με μικτό βέβαια πληθυσμό αλλά εμφανή τον ελληνικό τους χαρακτήρα την εποχή εκείνη. Αυτό πρακτικά σήμαινε ότι για ένα μεγάλο τμήμα του ελληνικού στοιχείου της Αλβανίας δεν αναγνωρίζονταν ούτε τα στοιχειώδη εκείνα δικαιώματα που προέβλεπαν οι διεθνείς συνθήκες, ούτε βέβαια το δικαίωμα της εκπαίδευσης στη μητρική γλώσσα, που κυρίως μας ενδιαφέρει εδώ." ^ Manta. Italian influence upon Greek - Albanian relations. 2005. p. 52. "Ιδιαίτερο ενδιαφέρον από ελληνικής πλευράς παρουσίαζαν οι πόλεις του Αργυροκάστρου, των Αγιών Σαράντα καιτης Κορυτσάς, γνωστά κέντρα του ελληνισμού της Αλβανίας, και στη συνέχεια η Πρεμετή και η Χιμάρα. ΘΘα πρέπει ίσως στο σημείο αυτό να θυμίσουμε ότι για του ςΈλληνες των αστικών κέντρων, με εξαίρεση τη χιμάρα, δεν αναγνωρίζοταν το καθεστώς του μειονοτικού ούτε τα δικαιώματα που απέρρεαν από αυτό. "; p. 54. "Ήδη από τις αρχές του σχολικού έτους 1925-26 ξεκίνησαν οι προσπάθειες για το άνοιγμα ενός σχολείου στους Άγιους Σαράντα, τους οποίους μάλιστα οι ελληνικές αρχές, σε αντίθεση με τις αλβανικές, δεν συγκατέλεγαν μεταξύ των ‘αλβανόφωνων κοινοτήτων’, καθώς ο ελληνικός χαρακτήρας της πόλης ήταν πασιφανής. Σε ό,τι αφορούσε το ελληνικό σχολείο της πόλης, η Επιτροπή επί των Εκπαιδευτικών σχεδίαζε να το οργανώσει σε διδασκαλείο, τοποθετώντας σε αυτό υψηλού επιπέδου και ικανό διδασκαλικό προσωπικό, ώστε να αποτελέσει σημαντικό πόλο έλξης για τα παιδιά της περιοχής, αλλά και παράδειγμα οργάνωσης και λειτουργίας σχολείου και για τις μικρότερες κοινότητες. Τις μεγαλύτερες ελπίδες για την επιτυχία των προσπαθειών της φαίνεται ότι στήριζε η Επιτροπή στην επιμονή του ελληνικού στοιχείου της πόλης, στην πλειοψηφία τους ευκατάστατοι έμποροι που θα ήταν διατεθειμένοι να προσφέρουν ακόμη και το κτίριο για τη λειτουργία του, αλλά και στην παρουσία και τη δραστηριοποίηση εκεί του ελληνικού υποπροξενείου 58 . Όλες οι προσπάθειες ωστόσο αποδείχθηκαν μάταιες και ελληνικό κοινοτικό σχολείο δεν λειτούργησε στην πόλη όχι μόνο το σχολικό έτος 1925-26, αλλά ούτε και τα επόμενα χρόνια." ^ a b c In King, Mai, Schwandner-Sievers 2005. De Rapper, Gilles (2005). "Better than Muslims, not as good as Greeks: Migration as Imagined and Experienced by the Albanian Christians of Lunxhëri". Page 175 : "Until the 1960s, Lunxhëri was mainly inhabited by Albanian-speaking Orthodox Christians called the Lunxhots. By then, and starting during and just after the Second World War, many of them had left their villages to settle in Gjirokastër and in the towns of central Albania, where living conditions and employment opportunities were considered better. They were replaced, from the end of the 1950s on, by Vlachs, forced by the regime to settle in agricultural cooperatives. Some Muslim families from Kurvelesh, in the mountainous area of Labëria, also came to Lunxhëri at the same time – in fact, many of them were employed as shepherds in the villages of Lunxhëri even before the Second World War. While Lunxhëri practiced (as did many other regions) a high level of (territorial) endogamy, marriage alliances started to occur between Christians Lunxhots and members of the Greek minority of the districts of Gjirokastër (Dropull, Pogon) and Sarandë. Such alliances were both encouraged by the regime and used by people to facilitate internal mobility and obtain a better status and life-chances. "; p. 181.The issue of a couple of new villages created during communism illustrates this case. The village of Asim Zenel, named after a partisan from Kurvelesh who was killed in July 1943, was created as the centre of an agricultural cooperative in 1947 on the road leading from Lunxhëri to Dropull. The people who were settled in the new village were mainly shepherds from Kurvelesh, and were Muslims. The same thing happened for the village of Arshi Llongo, while other Muslims from Kurvelesh settled in the villages of lower Lunxhëri (Karjan, Shën Todër, Valare) and in Suhë. As a result, it is not exceptional to hear today from the Lunxhots, such as one of my informants, a retired engineer living in Tirana, that ‘in 1945 a Muslim buffer-zone was created between Dropull and Lunxhëri to stop the Hellenisation of Lunxhëri. Muslims were thought to be more determined against Greeks. At that time, the danger of Hellenisation was real in Lunxhëri’. In the village of Këllëz people also regret that ‘Lunxhëri has been surrounded by a Muslim buffer-zone by Enver Hoxha, who was himself a Muslim’." Page 182: "By the end of the nineteenth century, however, during the period of the kurbet, the Lunxhots were moving between two extreme positions regarding ethnic and national affiliation. On the one hand, there were those who joined the Albanian national movement, especially in Istanbul, and made attempts to spread a feeling of Albanian belonging in Lunxhëri. The well-known Koto Hoxhi (1825-1895) and Pandeli Sotiri (1843-1891), who participated in the opening of the first Albanian school in Korçë in 1887, were both from Lunxhëri (from the villages of Qestorat and Selckë). On the other hand were those who insisted on the Greekness of the Lunxhots and were opposed to the development of an Albanian national identity among the Christians." ^ George H. Chase. Greece of Tomorrow, ISBN 1-4067-0758-9, page 41. ^ Pyrrhus J. Ruches. Albania's Captives. Argonaut, 1965 (University of California). ^ Albania in the Twentieth Century, A History: Volume II: Albania in Occupation and War, 1939-45. Owen Pearson. I.B.Tauris, 2006. ISBN 1-84511-104-4. ^ Pyrrhus J. Ruches. 1965: 172 "The entire carnage, arson and imprisonment suffered by the hands of Balli Kombetar...schools burned". ^ Milica Zarkovic Bookman (1997). The demographic struggle for power: the political economy of demographic engineering in the modern world. Routledge. p. 245. ISBN 978-0-7146-4732-6. ^ Waal, Clarissa de (2005). Albania today : a portrait of post-communist turbulence. London [u.a. ]: Tauris. p. 5. ISBN 9781850438595. ^ Clogg 2002: 203 "Like all Albanians, the members of the Greek minority had suffered severe repression during the communist era and cross-border family visits had been out of the question. Although basic linguistic, educational and cultural rights were conceded there had been attempts to disperse the minority pressure had been applied on its members to adopt authentically "Illyrian" names." ^ Petiffer 2001: "...under communism, pupils were taught only Albanian history and culture, even in Greek-language classes at the primary level." ^ a b c Petiffer 2001: "...the area studied was confined to the southern border fringes, and there is good reason to believe that this estimate was very low". "Under this definition, minority status was limited to those who lived in 99 villages in the southern border areas, thereby excluding important concentrations of Greek settlement in Vlorë (perhaps 8000 people in 1994) and in adjoining areas along the coast, ancestral Greek towns such as Himara, and ethnic Greeks living elsewhere throughout the country. Mixed villages outside this designated zone, even those with a clear majority of ethnic Greeks, were not considered minority areas and therefore were denied any Greek-language cultural or educational provisions. In addition, many Greeks were forcibly removed from the minority zones to other parts of the country as a product of communist population policy, an important and constant element of which was to pre-empt ethnic sources of political dissent. Greek place-names were changed to Albanian names, while use of the Greek language, prohibited everywhere outside the minority zones, was prohibited for many official purposes within them as well." ^ Frucht, Richard C. (2003). Encyclopedia of Eastern Europe: From the Congress of Vienna to the Fall of Communism. Taylor & Francis Group. p. 148. ISBN 0-203-80109-1. ^ Frucht, Richard C. (2003). Encyclopedia of Eastern Europe: From the Congress of Vienna to the Fall of Communism. Taylor & Francis Group. p. 640. ISBN 0-203-80109-1. ^ Valeria Heuberger; Arnold Suppan; Elisabeth Vyslonzil (1996). Brennpunkt Osteuropa: Minderheiten im Kreuzfeuer des Nationalismus (in German). Oldenbourg Wissenschaftsverlag. p. 71. ISBN 978-3-486-56182-1. ^ David Shankland. Archaeology, anthropology, and heritage in the Balkans and Anatolia Isis Press, 2004. ISBN 978-975-428-280-1, p. 198. ^ Dimitropoulos, Kontsantinos-Fotios (2011). "The Social and Political Structure of Hellenism in Albania in the Post-Hotza Era". www.didaktorika.gr. Panteion University: 213–216. doi:10.12681/eadd/23044. Retrieved 29 June 2015. Στις "μειονοτικές ζώνες" δημιουργούνται νέα χωριά με εποίκους ή μικτοποιούνται άλλα που παραδοσιακά κατοικούνται αποκλειστικά από Έλληνες...Στην Χιμάρα... η μετάβαση στον πολικοματισμόο βρίσκει να διαμένουν μόνιμα στην κωμόπολη, τριακόσιες οικογένειες Αλβανών ... δημιουργήθηκε ένας νέος οικισμός 3.000 αλβανοτσάμηδων, η Γκιάστα. ^ Olsen, Neil (2000). Albania. Oxfam. p. 19. ISBN 0-85598-432-5. ^ Turnock, David (1997). The East European economy in context: communism and transition. Routledge. p. 48. ISBN 0-415-08626-4. ^ Working Paper. Albanian Series. Gender Ethnicity and Landed Property in Albania. Sussana Lastaria-Cornhiel, Rachel Wheeler. September 1998. Land Tenure Center. University of Wisconsin. "Hoxha's regime maintained an extensive gulag...40 percent. ^ Petiffer 2001: "...onset in 1967 of the campaign by Albania’s communist party, the Albanian Party of Labour (PLA), to eradicate organised religion, a prime target of which was the Orthodox Church. Many churches were damaged or destroyed during this period, and many Greek-language books were banned because of their religious themes or orientation. Yet, as with other communist states, particularly in the Balkans, where measures putatively geared towards the consolidation of political control intersected with the pursuit of national integration, it is often impossible to distinguish sharply between ideological and ethno-cultural bases of repression. This is all the more true in the case of Albania’s anti-religion campaign because it was merely one element in the broader "Ideological and Cultural Revolution" begun by Hoxha in 1966 but whose main features he outlined at the PLA’s Fourth Congress in 1961. ^ Petiffer 2001: "In 1991, Greek shops were attacked in the coastal town of Saranda, home to a large minority population, and inter-ethnic relations throughout Albania worsened". ^ a b c Valeria Heuberger; Arnold Suppan; Elisabeth Vyslonzil (1996). Brennpunkt Osteuropa: Minderheiten im Kreuzfeuer des Nationalismus (in German). p. 67-75: Oldenbourg Wissenschaftsverlag. p. 74. ISBN 978-3-486-56182-1. ^ Clogg 2002: 214. "This war of words culminated in the arrest by the Albanian authorities in May of six members of the Onomoia, the main Greek minority organization in Albania. At their subsequent trial, five of the six received prison sentences of between six and eight years for treasonable advocacy of the secession of "Northern Epirus" to Greece and the illegal possession of weapons. ^ Greek Helsinki Monitor: Greeks of Albania and Albanians in Greece Archived 2009-03-16 at the Wayback Machine, September 1994. ^ Greek Ministry for Foreign Affairs: Bilateral relations between Greece and Albania. ^ World Directory of Minorities and Indigenous People Archived 2014-11-15 at the Wayback Machine: Albanian overview: Greeks. ^ "Σκληρό διάβημα της Αθήνας στα Τίρανα για τη Χειμάρρα: "Σταματήστε να γκρεμίζετε τα σπίτια των Ελλήνων της Βορείου Ηπείρου"". ^ "Albanian nationalists increase tensions with gunshots". Eleutherotypia. September 20, 2010. Retrieved December 17, 2010. ^ survival, cultural (19 March 2010). ""Northern Epiros": The Greek Minority in Southern Albania". ^ a b "Bilateral relations between Greece and Albania". Ministry of Foreign Affairs-Greece in the World. Retrieved September 6, 2006. ^ ''Eastern Europe at the end of the 20th century'', Ian Jeffries, p. 69. 1993-06-25. ISBN 978-0-415-23671-3. Retrieved 2010-08-27. ^ "UNPO". Archived from the original on October 5, 2006. Retrieved September 6, 2006. ^ CIA World Factbook (2006). "Albania". Retrieved July 26, 2006. ^ The CIA World Factbook (1993) provided a figure of 8% for the Greek minority in Albania. ^ Kosta Barjarba. "Migration and Ethnicity in Albania: Synergies and Interdependencies" (PDF). ^ Triandafyllidou, Anna (2009). Migration and Migration Policy in Greece. Critical Review and Policy Recommendations. Hellenic Foundation for European and Foreign Policy (ELIAMEP). Data taken from Greek ministry of Interiors. p. 3. "Greek co ethnics who are Albanian citizens (Voreioepirotes) hold Special Identity Cards for Omogeneis (co-ethnics) (EDTO) issued by the Greek police. EDTO holders are not included in the Ministry of Interior data on aliens. After repeated requests, the Ministry of Interior has released data on the actual number of valid EDTO to this date. Their total number is 189,000." ^ a b Kallivretakis, Leonidas (1995). "Η ελληνική κοινότητα της Αλβανίας υπό το πρίσμα της ιστορικής γεωγραφίας και δημογραφίας [The Greek Community of Albania in terms of historical geography and demography." In Nikolakopoulos, Ilias, Kouloubis Theodoros A. & Thanos M. Veremis (eds). Ο Ελληνισμός της Αλβανίας [The Greeks of Albania]. University of Athens. pp. 51-58. ^ Winnifrith, Tom (1995). "Southern Albania, Northern Epirus: Survey of a Disputed Ethnological Boundary Archived 2015-07-10 at the Wayback Machine". Farsarotul. Retrieved 14-6-2015. ^ "Albania: The state of a nation". ICG Balkans Report N°111. p. 15. Archived from the original (PDF) on 2010-08-08. Retrieved 2010-09-02. The coastal Himara region of Southern Albania has always had a predominantly ethnic Greek population. ^ Dimitropoulos, Konstantinos (2011). Social and political policies regarding Hellenism in Albania during the Hoxha period (Thesis). Panteion University of Social and Political Sciences. p. 11. ^ a b p. 6. "In contrast, Albanian governments use a much lower figure of 58,000 which rests on the unrevised definition of “minority” adopted during the communist period. Under this definition, minority status was limited to those who lived in 99 villages in the southern border areas, thereby excluding important concentrations of Greek settlement in Vlora (perhaps 8000 people in 1994) and in adjoining areas along the coast, ancestral Greek towns such as Himara, and ethnic Greeks living elsewhere throughout the country. Mixed villages outside this designated zone, even those with a clear majority of ethnic Greeks, were not considered minority areas and therefore were denied any Greek-language cultural or educational provisions. In addition, many Greeks were forcibly removed from the minority zones to other parts of the country as a product of communist population policy, an important and constant element of which was to pre-empt ethnic sources of political dissent. Greek place-names were changed to Albanian names, while use of the Greek language, prohibited everywhere outside the minority zones, was prohibited for many official purposes within them as well." ^ Ruches, Pyrros (1965). "Albania's Captives". Chicago, USA: Argonaut: 92–93. ^ Second Report Submitted By Albania Pursuant to Article 25, Paragraph 1 Archived 2009-03-19 at the Wayback Machine, of the Framework Convention for the Protection of National Minorities. ^ Committee on the Framework Convention for the Protection of National Minorities: Second Opinion on Albania 29 May 2008. Council of Europe: Secretariat of the Framework Convention for the Protection of National Minorities. ^ Albanian Human Rights Practices, 1993. Author: U.S. Department of State. January 31, 1994. ^ "International Religious Freedom Report for 2014: Albania" (PDF). www.state.gov. United States, Department of State. p. 5. Retrieved 20 October 2015. Ethnic Greek minority groups had encouraged their members to boycott the census, affecting measurements of the Greek ethnic minority and membership in the Greek Orthodox Church. ^ a b George Gilson (27 September 2010). "Bad blood in Himara". Athens News. Archived from the original on 21 July 2011. Retrieved 4 November 2010. ^ "Με αποχή απαντά η μειονότητα στην επιχείρηση αφανισμού της". ethnos.gr. Retrieved 27 September 2011. ^ "Ανησυχίες της ελληνικής μειονότητας της Αλβανίας για την απογραφή πληθυσμού". enet.gr. Retrieved 27 September 2011. ^ "Η ελληνική ομογένεια στην Αλβανία καλεί σε μποϊκοτάζ της απογραφής". kathimerini.gr. Retrieved 30 September 2011. ^ "Albanian census worries Greek minority". athensnews. Retrieved 17 October 2011. ^ ""Omonoia" and other minority organizations in Albania, are calling for a census boycott". en.sae.gr. Athens News Agency (ANA). Retrieved 11 December 2014. ^ "Omonias Census: Greek Minority Constitutes 10% of Population in Albania". Independent Balkan News Agency. Retrieved 11 December 2014. ^ Petiffer 2001: "Following strong protests by the Conference on Security... this decision was revered." ^ Erlis Selimaj (2007-02-19). "Albanians go to the polls for local vote". Southeast European Times. Retrieved 2007-02-22. ^ Albania: Profile of Asylum claims and country conditions. United States Department of State. March 2004, p. 6. ^ "Albanische Hefte. Parlamentswahlen 2005 in Albanien" (PDF) (in German). Deutsch-Albanischen Freundschaftsgesellschaft e.V. 2005. p. 32. Archived from the original (PDF) on 2011-07-18. ^ "Εκρηκτικός μηχανισμός στο σπίτι του Δημάρχου Χιμάρας". ^ a b c "Tensions resurface in Albanian-Greek relations". Balkan Chronicle. 13 September 2010. Archived from the original on 7 July 2011. Retrieved 4 November 2010. Iorwerth E. S. Edwards; John Boardman; Nicholas Geoffrey Lemprière Hammond (2000). The Cambridge Ancient History - The Expansion of the Greek World, Eighth to Sixth Centuries B.C. Part 3: Volume 3. Cambridge University Press. ISBN 0-521-23447-6. Bowden, William (2003). Epirus Vetus: The Archaeology of a Late Antique Province. Duckworth. ISBN 978-0-7156-3116-4. Clogg, Richard (2002). Concise History of Greece (Second ed.). Cambridge: Cambridge University Press. ISBN 0-521-80872-3. Victor Roudometof; Roland Robertson (2001). Nationalism, globalization, and orthodoxy: the social origins of ethnic conflict in the Balkans. Greenwood Publishing Group. ISBN 978-0-313-31949-5. Miranda Vickers; James Pettifer (1997). Albania: from anarchy to a Balkan identity. London: C. Hurst & Co. Publishers. ISBN 0-7156-3201-9. Nußberger Angelika; Wolfgang Stoppel (2001). "Minderheitenschutz im östlichen Europa (Albanien)" (PDF) (in German). Cologne: Universität Köln. Sussana Lastaria-Cornhiel; Rachel Wheeler (1998). "Working Paper. Albanian Series. Gender Ethnicity and Landed Property in Albania" (PDF). Land Tenure Center. University of Wisconsin. Petiffer, James (2001). The Greek Minority in Albania – In the Aftermath of Communism (PDF). Surrey, UK: Conflict Studies Research Centre. ISBN 1-903584-35-3. Archived from the original (PDF) on 2011-07-06. Gregorič, Nataša (2008). "Contested Spaces and Negotiated Identities in Dhermi/Drimades of Himare/Himara area, Southern Albania" (PDF). University of Nova Gorica. Archived from the original (PDF) on 2011-06-10. Fred, Abrahams (1996). Human rights in post-communist Albania. Human Rights Watch/Helsinki. ISBN 978-1-56432-160-2. Triadafilopoulos, Triadafilos (November 2000). "Power politics and nationalist discourse in the struggle for 'Northern Epirus': 1919-1921". Journal of Southern Europe and the Balkans. 2 (2): 149–162. doi:10.1080/713683343. Minahan, James (2002). Encyclopedia of the stateless nations: ethnic and national groups around the world. Greenwood Publishing Group. p. 218. ISBN 0-313-32384-4. Wikimedia Commons has media related to Northern Epirus. This page was last edited on 13 February 2019, at 22:53 (UTC).